We are Electrical Repairs Gravette AR who are committed to professionalism, total quality of our products and services, and most importantly to our customers’ overall satisfaction. Davitt Electric. was established in 2009, headquartered in Gravette, Arkansas. We specialize in Gravette electrical work and energy-savings solutions to residential, commercial and industrial facilities in Northwest Arkansas. We take a personal approach in monitoring and fine tuning each phase of every Gravette electrical project. It is our main priority that every Gravette customer receives a quality product which fits their needs and is completely satisfied with their service from design to the finished product. Whether you are looking to purchase a brand new electrical system, a panel upgrade, your circuit breaker needs to be replaced, our knowledgeable technicians are here to help you. We recognize the need for minimal down time when it comes to your home and business. From ceiling fan repairs and electrical wiring replacement to commercial electrical services, we have the necessary experience and expert knowledge to take on any electrical repair or installation project in Northwest Arkansas. Our company has had the pleasure of helping many clients in Gravette, offering expert electrical service, great value, and being distinguished by providing customized emergency electrical service. Our emergency electrical service contractors strive to provide homeowners with an emergency electrical service experience that is unmatched. Call today to find out why countless other Northwest Arkansas homeowners have chosen us for their emergency electrical needs! 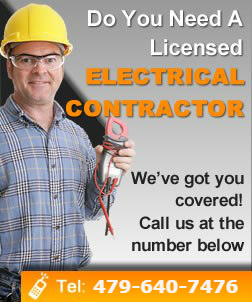 We also offer home electrical repairs, residential electric services, electrical service and emergency electrical service. For you to be able to ensure that you get the best possible job done in your home, you should limit your options among contractors that will be able to take the best possible care of your home systems. Even if highly skilled professionals tend to ask for higher fees than their other counterparts, there is no doubt that spending your money on their services will be worth it. Here are some points that you should keep in mind as you go about looking for the contractor who you will hire, to ensure that you will receive high quality services in your home. The first thing that you have to check out when you hire contractors to carry out electrical repairs in your home is the amount of experience the employees of the company can boast about. Obviously, you need to find a contractor that hires mechanics that can carry out the repairs that you need. There are a lot of resources that you may use to find the best mechanics in your area, so you need to make sure that you go through as many of them as possible.